One of the outstanding authors of entomological literature of the Eighteenth Century, Moses Harris (1730–c.1788) was interested in insect study from an early age. In this he was encouraged by his uncle who was a member of the first organised society of entomologists in England, the Society of the Aurelians. 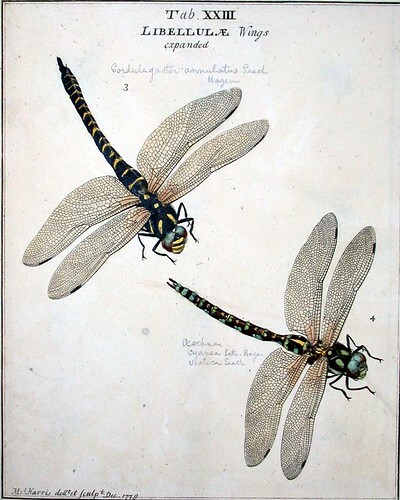 Harris wrote several works on insect life and, as an accomplished artist, was responsible for drawing, engraving, and colouring all his own work, maintaining at all times a high standard of accuracy. An exposition of English insects is considered by many to be Harris's major scientific work. It incorporates an earlier treatise in which Harris established a classification based on wing venation. In the introductory preface to the work, Harris explains that although he has kept close to the outline of the Linnaean system of classification, he hopes that in his system the observer 'at first sight of an insect ... shall be capable of not only knowing the class it refers to, but at the same time to what order and section of that class, and this by the wings only'. The main text is preceded by a colour wheel to aid the reader in judging the 'variety of teints that adorn the several parts of insects'. This is a copy of the first issue of the second edition of this work. It contains some fifty hand-coloured engravings by Harris.